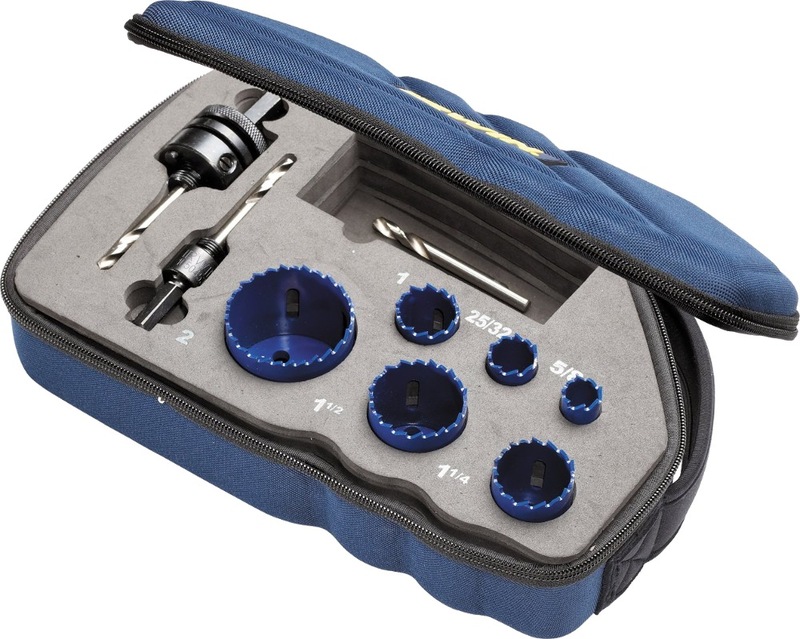 Irwin Bi-Metal Holesaw Kits are available in a unique attractive soft storage case that incorporates an unbreakable hinge and internal padding that protects its contents. The case has an integral handle and has a cardboard sleeve that contains important product information. The Bi-Metal holesaws cut through a variety of materials, including aluminium, copper, iron, stainless steel, wood and zinc. They have precision set teeth for faster penetration and the electron beam weld ensures stronger, longer lasting teeth. 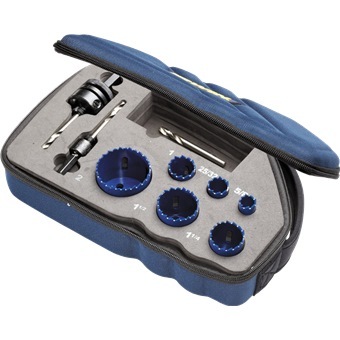 The Bi-Metal construction makes these holesaws tough and durable. 1 x 10504162 Holesaw 16mm. 1 x 10504165 Holesaw 20mm. 1 x 10504169 Holesaw 25mm. 1 x 10504173 Holesaw 32mm. 1 x 10504177 Holesaw 38mm. 1 x 10504184 Holesaw 51mm. 1 x 10504535 Mandrel 13mm - Fits 32 to 210mm holesaws. 1 x 10504536 Mandrel 9.5mm - Fits 14 to 30mm holesaws. 1 x 10504532 Pilot drill.